STOCKHOLM--(BUSINESS WIRE)-- THE FINDINGS from a pilot study into a new way of caring for those with cystic fibrosis (CF) have just been released. An innovative partnership between NuvoAir and London’s Royal Brompton Hospital was launched last year. It allowed patients taking part in the study the freedom to test themselves at home with the Air Next simple-to-use spirometer. 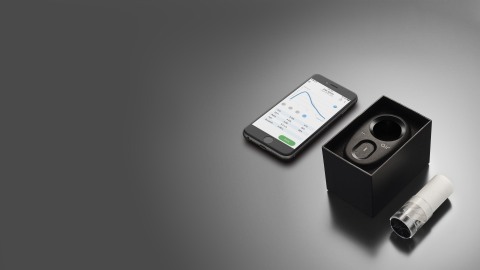 This hand-held device, when connected to software via Aria - an app exclusively developed by NuvoAir - can accurately measure the state of the patient’s lungs and predict worsening. Once this data has been collected on the Aria app, it can be analysed by the patient and shared remotely with their health care team and the hospital. Once the results from this study and other independent research were brought together, it revealed some fascinating insights. For example, the study suggests that the Air Next Spirometer and Aria software could help patients with life-long lung health conditions spot any deterioration in their lungs sooner. “The NuvoAir pilot study at the Royal Brompton has demonstrated that self-testing of lung function has many advantages and is only the start of an innovative way of caring for those with a chronic lung condition,” says Helen Parrott, Associate Director of Rehabilitation and Therapies at the Royal Brompton Hospital and Harefield NHS Foundation Trust. To discover how this exciting partnership between a forward-thinking Swedish health tech company and one of the world’s leading hospitals has already benefited CF patients and caregivers, read more about the findings here. Headquartered in Stockholm, Sweden, NuvoAir combines hardware, software and machine learning to improve lives of patients suffering from respiratory conditions and to enable better and faster clinical decisions. Royal Brompton hospital is the largest heart and lung medical centre in the United Kingdom. The hospital is part of Royal Brompton and Harefield NHS Foundation Trust, which includes Royal Brompton Hospital in Chelsea and Harefield Hospital near Uxbridge. Royal Brompton Hospital’s cystic fibrosis centre is one of the largest in Europe. It is a world leader in the development of new treatments and has become a model for other units in the UK and Europe.